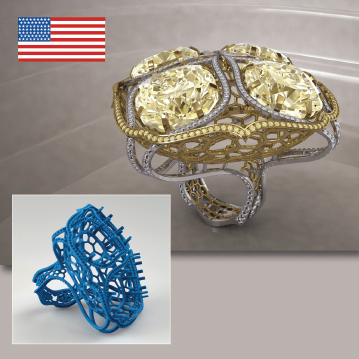 Solidscape®, Inc., the leading manufacturer of high precision 3D wax printers for the jewelry industry, and a subsidiary of Stratasys, Ltd. (Nasdaq: SSYS), announces the winners of the seventh annual Baselworld Design Competition. As the focal point of the watch and jewelry industry, Baselworld inspires industry leaders and top designers to showcase their creations and innovations on a worldwide stage. Every year Solidscape provides designers the opportunity to receive international recognition for their work. Winning Designs – Jewelry With a record number of forty-three amazing designs entered into this year’s competition, the judges have selected two winners for each Jewelry category. Capturing the Platinum Award for jewelry based on design aesthetic and technical criteria is Anna Popovych’s “Drop of Freedom” ring. As a talented CAD designer from Ukraine, Popovych is designing an entire collection around her beautiful, nature inspired forms. 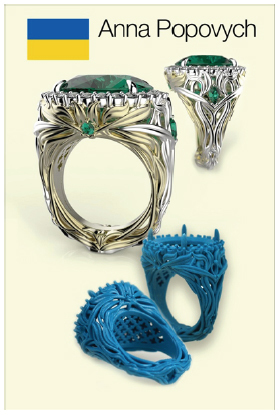 Tied for the Platinum Award for jewelry is the “Elementum 17” ring by Daniel Coffey from the United States. His challenging design with its delicate, interwoven lines is an excellent example of the design freedom possible with Solidscape high precision 3D printers. 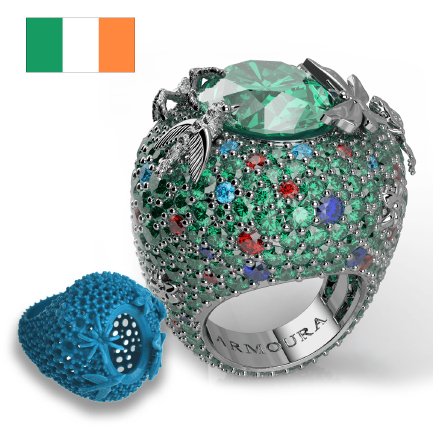 Stuart McGrath of Ireland’s Armoura Designs wins the Gold Award for jewelry with his “Rainforest” inspired ring. With nature as a recurring theme in his collection, this ring wraps exotic creatures among the forest and water colored gemstones. Tradition meets modern with the other Gold Award for jewelry winning design from Thailand’s Ananya Chuechanglek. This beautiful ring was inspired by the pattern and cone shape of a hand woven bamboo basket, called a “Chalom,” commonly used in Thailand. 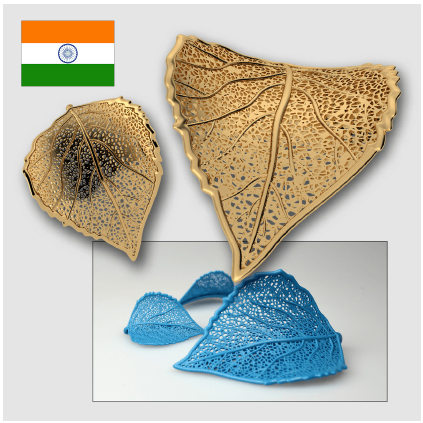 Meenakshi Rawa from India won the Silver Award for jewelry with her delicate pattern called “Leaf hair pin.” Not only did she realistically capture the detail of the leaf’s netted veins, but she added a subtle twisting curve to the leaf’s blade, adding to its overall beauty. Tied for the Silver Award for jewelry is the “Resting Butterflies” pendant by K. Abeney of CADLoft in Canada. This three dimensional double sided pendant shows a dozen interwoven butterflies resting together. The reverse of the pendant shows a beautiful pattern created by the wings of the butterflies. Winning Designs – Fine Art The “Fine Art” award category recognizes unique entrants that represent free form expression of nonjewelry designs executed in a manner similar to jewelry. They require mastery of CAD design and Solidscape’s industry-leading high precision 3D printers to create flawlessly castable pieces. 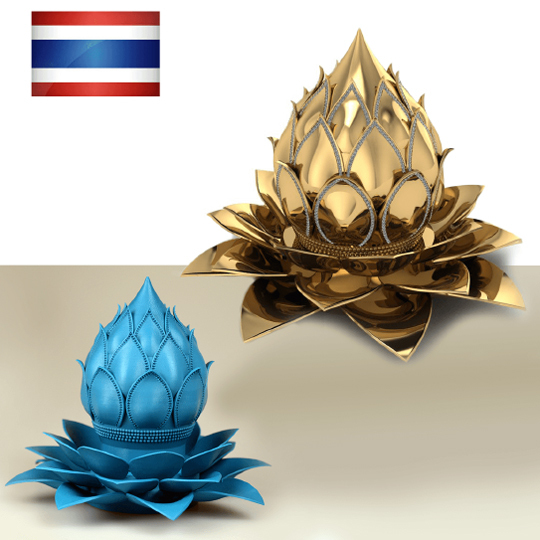 Prachaya Viriyasuthee of Triratana Jewelry in Thailand wins the Platinum Award in Fine Art for its stunning “Lotus Blossom Incense Burner.” The lotus flower has been a symbol of purity with its delicately tapering edges, recreated perfectly by the Solidscape high precision 3D printer. Design entries were judged based on successful wax modeling printed by a Solidscape 3D printer, best design (artistry and style), as well as best use of technology (CAD/Solidscape 3D printing). Winning designs are featured below, and all finalists’ pieces can be found in the design excellence centerpiece at Solidscape’s Baselworld exhibit, Hall 2.0 E61 or on the the Solidscape 2017 Baselworld Design Competition webpage. Solidscape® , Inc., a wholly owned subsidiary of Stratasys, Inc. (NASDAQ: SSYS), is the leader in high precision 3D printers for direct manufacturing applications. 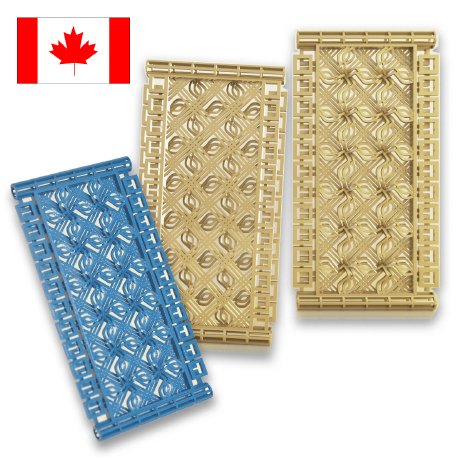 Over the years, Solidscape has set the bar for the highest standards in surface finish, accuracy and material castability, enabling customers to create intricate wax patterns for investment casting in any metal or for creating silicon or metal molds. Solidscape printers are marketed through a global network of distribution partners, and are used for casting fine jewelry, turbine blades, medical, orthopedics, consumer goods, electronics, toys and many other high precision products. Learn more at www.solid-scape.com. For more than 25 years, Stratasys Ltd. (NASDAQ:SSYS) has been a defining force and dominant player in 3D printing and additive manufacturing – shaping the way things are made. Headquartered in Minneapolis, Minnesota and Rehovot, Israel, the company empowers customers across a broad range of vertical markets by enabling new paradigms for design and manufacturing. The company’s solutions provide customers with unmatched design freedom and manufacturing flexibility – reducing time-to-market and lowering development costs, while improving designs and communications. Stratasys subsidiaries include MakerBot and Solidscape, and the Stratasys ecosystem includes 3D printers for prototyping and production; a wide range of 3D printing materials; parts on-demand via Stratasys Direct Manufacturing; strategic consulting and professional services; and the Thingiverse and GrabCAD communities with over 2 million 3D printable files for free designs. With more than 2,700 employees and 1200 granted or pending additive manufacturing patents, Stratasys has received more than 30 technology and leadership awards. Visit us online at: www.stratasys.com or http://blog.stratasys.com/, and follow us on LinkedIn.